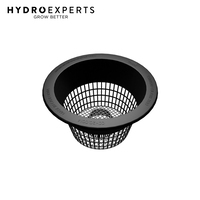 The Velcro-Seamed Geopot allows the side of the container to open for easy removal of the root ball when transplanting, which makes transplanting quick and easy while reducing transplanting shock. This breathable fabric plant container air prunes your plants' roots when they reach the end of the container. The air root pruning process forces the roots to branch out with more fibrous feeder roots which are much more efficient in taking up water and nutrients. The very durable geotextile fabric is porous, allowing air into the root zone and provides great drainage creating a healthy environment for the roots. This combination of air root pruning and aeration of the root zone allows your plants to reach their fullest potential. Question: How long will these fabric containers last? 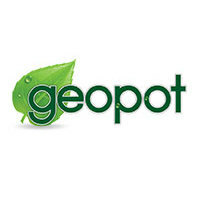 Answer: The longevity of our GeoPots varies between each user. For our smaller container users who may be doing an indoor project and will be washing between cycles, the GeoPot can last as long as 5 cycles! 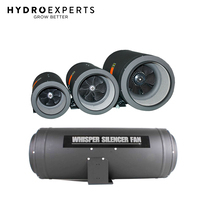 For our medium scale growers who could be using anywhere between a 20-45 gallon, we project about a 3 year lifespan. And finally, for those big time farmers that trial all the way up to our 400 gallon, we recommend looking to renew after about 2-3 years. Question: What about your Glite lifespan? Our Glite Series are recommended for those that are watching their budget and would like to receive air root pruning without spending too much money. The Glite is made with a little bit thinner material so it will last about 2-3 cycles (with or without washing). Question: Will I have to water these more often because they are more porous? -David Robinson, ‘The Grower’s Handbook’. Poor drainage will cause root rot. Root rot is a condition found in both indoor and outdoor plants, although more common in indoor plants with poor drainage. Usually, this is a result of over-watering. In both indoor and outdoor plants, it is usually lethal and there is no effective treatment. The excess water makes it very difficult for the roots to get the air that they need, causing them to decay. To avoid root rot, it is best to only water plants when the soil becomes dry, and to put the plant in a well-drained pot. Question: What is the difference between your black and tan style of GeoPots? 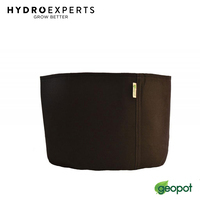 Our black GeoPot original is great for warming up those roots in the cool morning air as well as concealing dirt runoff or residue from your plants. Tan is a great alternative for your garden to achieve a more blended feel. We recommend the tan for asthetics and décor as well as blending. The tans provide about a 2 or 3 degree temperature difference in hotter climate area. Both of these designs will be less hot on your developing root zone when compared to plastic or terracotta due to the constant air flow through our fabric GeoPot. Question: What are your GeoPots made of? It is made of a UV Stabilized Geo-textile Polypropylene fiber that is heat bonded on one side. It is safe for organic gardening and will last about 2-3 years even with periodical machine washes. You can wash your pots with either Oxyclean or peroxide to sterilize. It works extremely well in removing any build up residue without leaving behind and residue itself. Question: How does one wash or sterilize their GeoPots between uses? The primary advantage of the GeoPot is its air pruning capability, which results in healthier roots being able to provide more nutrients to the plant. With traditional plastic pots, the plant's roots will reach the edge of the container and be forced to circle the container in search of a friendlier environment. As these roots circle, minimal lateral branching will occur resulting in poor nutrient uptake and cause the roots to quickly become root bound. What makes the GeoPot so unique is when the plant roots reach the container's edge its root tips are trapped by the porous fabric and when these root tips meet the air on the outside of the pot, they are naturally pruned. This pruning process forces lateral branching of desired fibrous feeder roots. 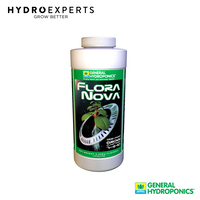 These fibrous roots are more productive in the uptake of water and nutrients, resulting in a healthier, more robust plant that utilizes the entire root zone for optimum plant growth. 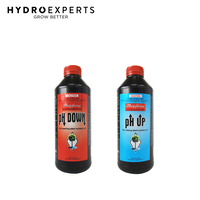 A common problem with traditional plastic containers is poor drainage leading to anaerobic condition that result in soil borne diseases like Phytophthora and Pythium, responsible for devastating root rot. 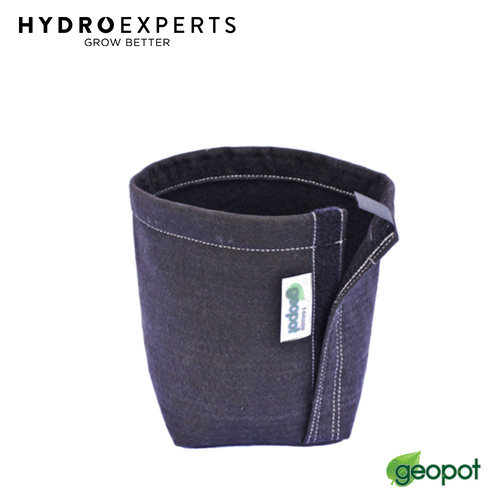 Because of GeoPot's unique porous fabric, excess water can easily drain from the container keeping moisture at an ideal level for healthy plant growth. 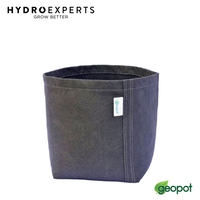 GeoPot's allow air to penetrate the sides of the container, keeping it cool when exposed to direct sun on hot summer days through the process of evaporative cooling. According to a study done by Catherine A. Neal at the University of New Hampshire, Dept. of Plant Biology: "In comparison to standard black plastic nursery pots, above ground fabric containers reduce maximum root zone temperatures through evaporative cooling and reduced absorption of solar radiation. Plants grown in fabric containers also have improved root structure as a result of air root pruning." Everyone has seen the monster plants and incredible yields from GeoPots used for growing outdoors. When used indoors, not only do you have the unique combination of air root pruning and aeration of the root zone, but GeoPot is the ideal container for some of the most popular hydroponic systems (Ebb-n-flow; Drip circulating; Bucket system; Deep water culture) because nutrients can easily pass in and out of the porous fabric. The fabric can be used like a filter during the flow cycle only allowing the nutrients back to the reservoir. 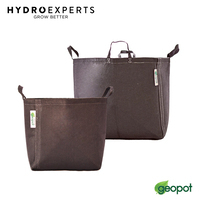 GeoPots are available in both black and tan colors. Our sizes range from 1 to 400 gallon with options to add convenient handles. We recently launched our GeoPot Transplanter Pot that has a Velcro seam down the side. This allows the side of the container to open for easy removal of the root ball when transplanting, which makes transplanting quick and easy. GeoPot Transplanter Pots are available in 1 gallon to 7 gallon sizes.